As comet 46P/Wirtanen neared Earth on December 2, astronomers using the Atacama Large Millimeter/submillimeter Array (ALMA) took a remarkably close look the innermost regions of the comet's coma, the gaseous envelope around its nucleus. ALMA imaged the comet when it was approximately 16.5 million kilometers from Earth. At its closet on December 16, the comet – one of the brightest in years—was approximately 11.6 million kilometers from Earth, or about 30 times the distance from the Earth to the moon. 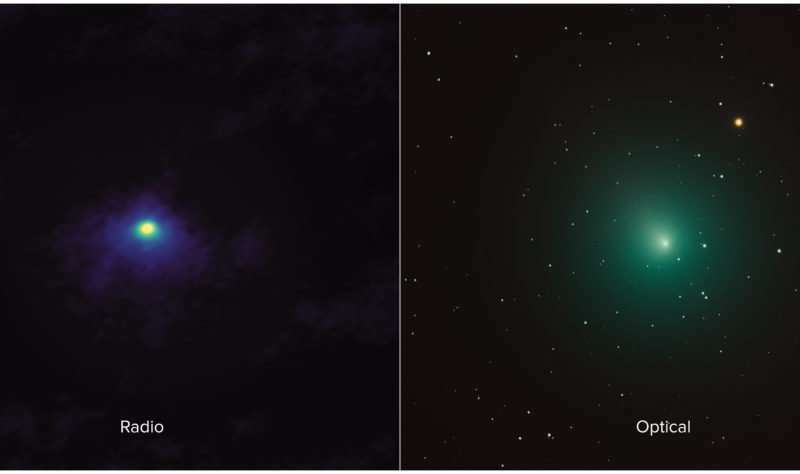 "This comet is causing a stir in the professional and amateur astronomy communities due to its combined brightness and proximity, which allows us to study it in unprecedented detail" said NASA's Martin Cordiner, who led the team that made the ALMA observations. "As the comet drew nearer to the Sun, its icy body heated up, releasing water vapor and various other particles stored inside, forming the characteristic puffed-up coma and elongated tail." The ALMA image of comet 46P/Wirtanen zooms-in to very near its nucleus – the solid "dirty snowball" of the comet itself—to image the natural millimeter-wavelength "glow" emitted by molecules of hydrogen cyanide (HCN), a simple organic molecule that forms an ethereal atmosphere around the comet. ALMA, using its remarkable ability to see fine details, was able to detect and image the fine-scale distribution of this particular molecule. The HCN image shows a compact region of gas and an extended, diffuse, and somewhat asymmetrical, pattern in the inner portion of the coma. Due to the extreme proximity of this comet, most of the extended coma is resolved out, so these observations are only sensitive to the innermost regions, in the immediate vicinity of the nucleus. The astronomers also performed observations of more complex molecules on Dec 9, when the comet was 13.6 million kilometers from Earth. Comet 46P/Wirtanen orbits the Sun once every five-and-a-half years, which is remarkably brisk compared to its more famous cousin Halley's Comet, which has an orbital period of about 75 years. Other bright comets can have periods that are on the order of hundreds and even thousands of years. The comet may yet be visible to the naked eye. For comparison, an optical view of the comet taken by an amateur astrophotographer is shown. Though they appear to be similar, the ALMA image spans an area of the sky only about 5 arcseconds – about 1000 times smaller than the optical image – meaning ALMA is looking at the very fine-scale features in the coma. This and previous observations of comets with ALMA confirm that they are rich in organic molecules, and may therefore have seeded the early Earth with the chemical building blocks of life.